This is THE perfect time of year to grill in Texas. Most of the pollen has dissipated, it's warm, but summer's oppressive heat and humidity haven't yet arrived. We've never been big grillers. As a matter of fact, we've ruined a few grills leaving them unused out in the elements. When we had dinner at our friends' house recently and they grilled up the most delicious food, I was determined that we start grilling in earnest. 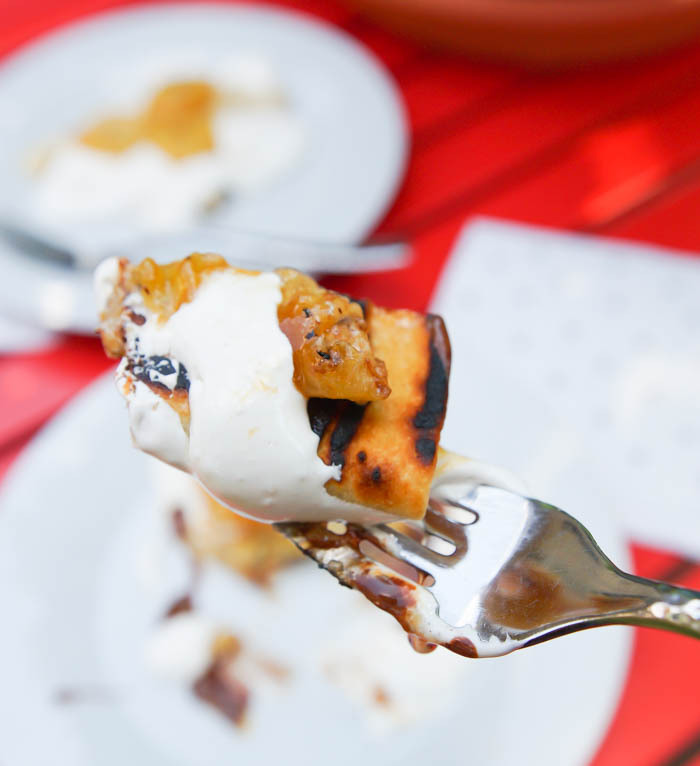 Before we talk more about grilling, let me give you a peek at this dessert quesadilla: Grilled Peanut Butter and Chocolate Quesadillas with Caramelized Bananas. Oh baby. I bought a little tabletop grill...just the thing for our family of 3, especially with our boy soon to fly the coop. You know me...I wanted to break it in with a dessert recipe. Burgers can come later. I also needed a tabletop for this tabletop grill. Funny thing, Mr. E and I looked and looked for a little bistro set, but couldn't find one we really loved for the right price. I decided I could just put our tabletop grill on the ground for the time being. 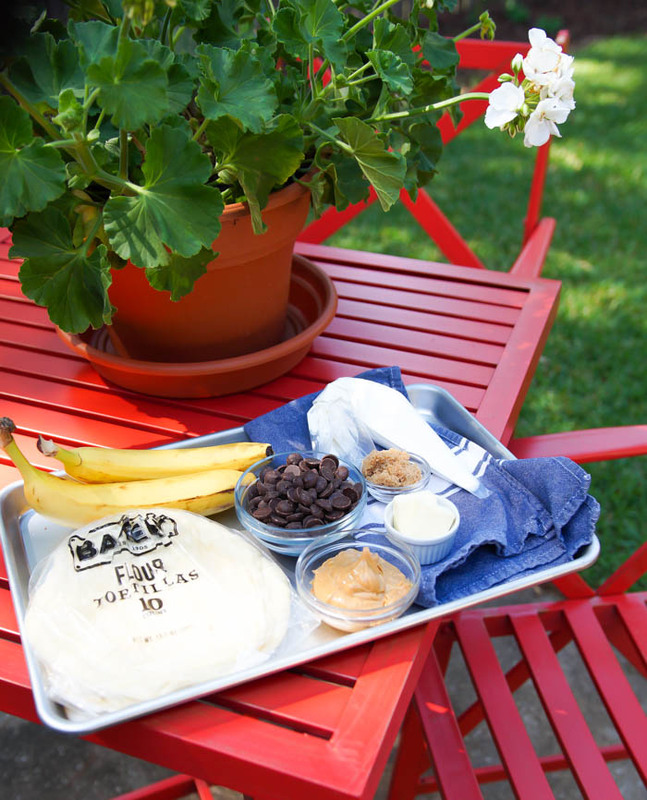 Off I went to H-E-B for the ingredients for this grilled dessert. Not only did I find the ingredients, but I came home with a cast iron comal pan, gorgeous white geraniums, AND the cutest little bistro set EVER. All from my grocery store. 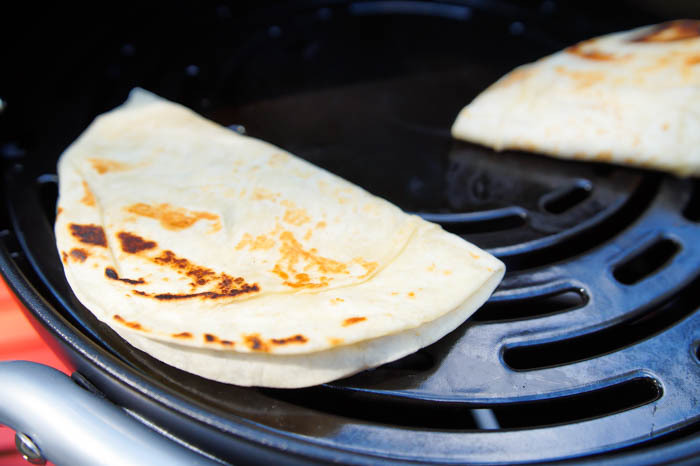 I knew I wanted to make grilled quesadillas right away. At H-E-B, they have a tortillaria in store. That's right...tortillas made fresh, in-house, right before your eyes, all day long. I stop here every time I run to the store. Maybe I was channeling my inner Elvis, but I couldn't stop thinking about bananas and peanut butter. 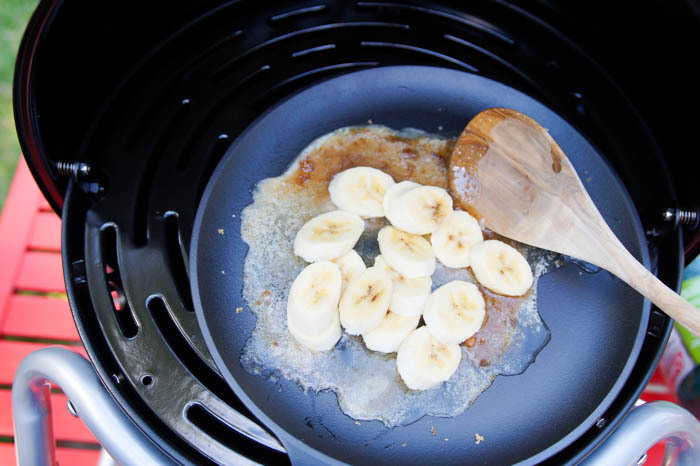 I used this cute little comal pan to caramelize the bananas in brown sugar and butter right on the grill. For the quesadilla filling, I spread on peanut butter and sprinkled with bittersweet chocolate chips and a little cinnamon. Folded over and spread with a little butter, the quesadillas are ready for the grill. There is just something about grilled food, isn't there? 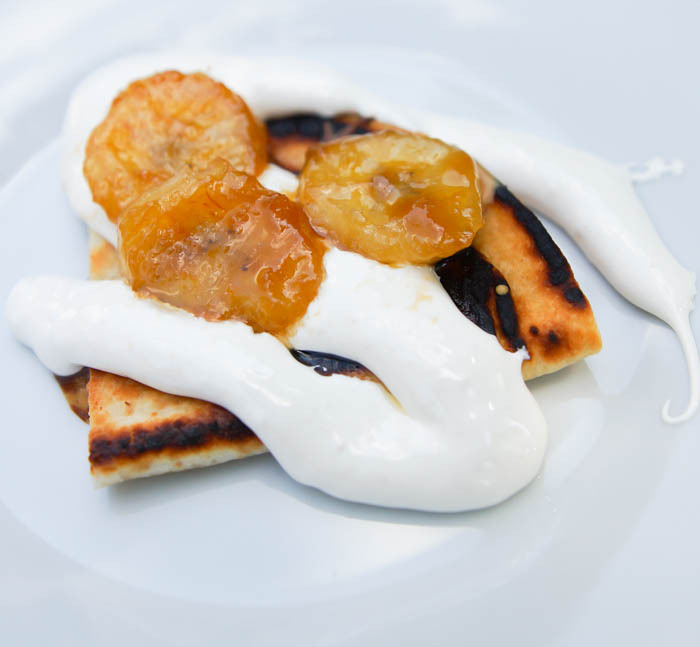 Once the quesadillas are cooked, cut in half and top with marshmallow creme and the caramelized bananas. 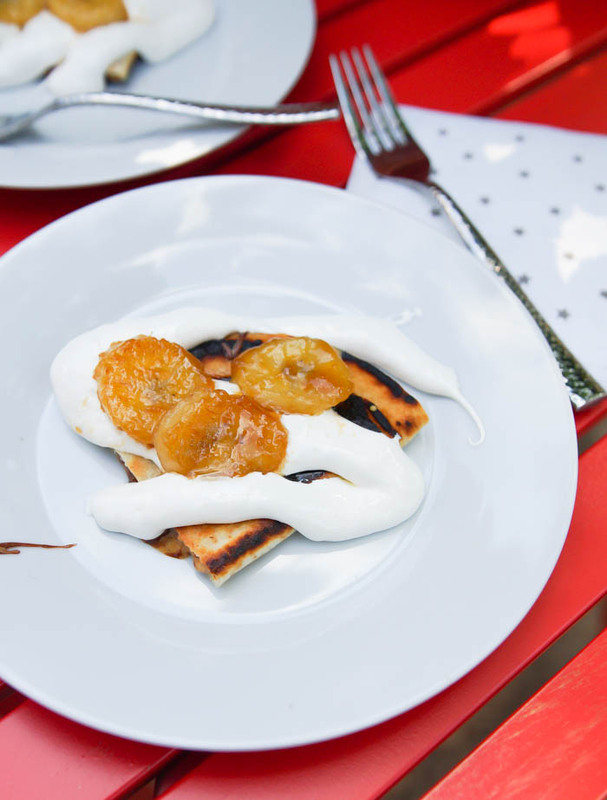 The gooey marshmallow creme along with the melty peanut butter and chocolate are so delicious paired with the crispy, grilled tortilla and golden bananas. 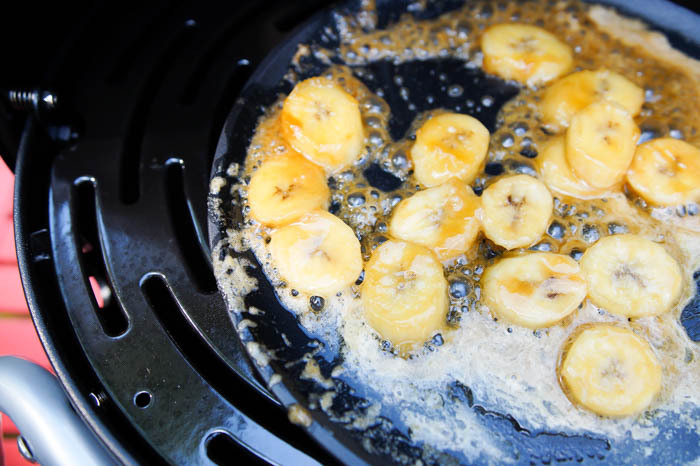 If you have a peanut butter and banana lover in your life, grill them up one of these. 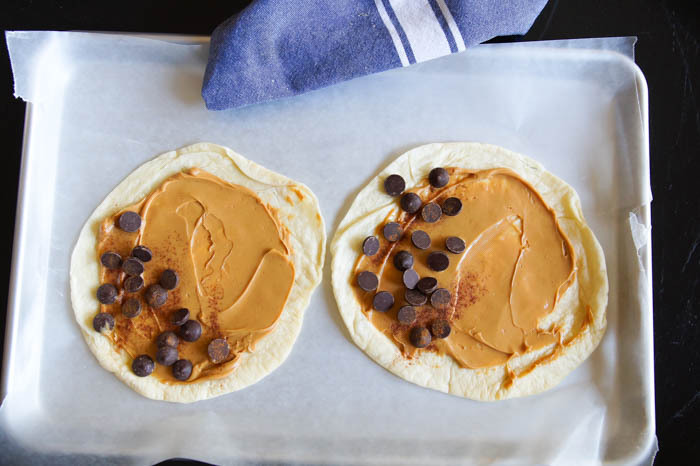 Divide the peanut butter between the two tortillas. Spread almost to the edges. 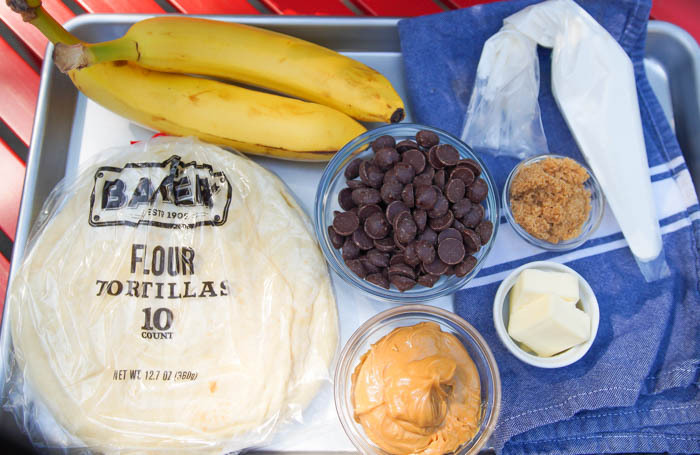 Sprinkle 1 1/2 tablespoons chocolate chips on one-half of each tortilla. Sprinkle with cinnamon. Fold the tortillas in half. 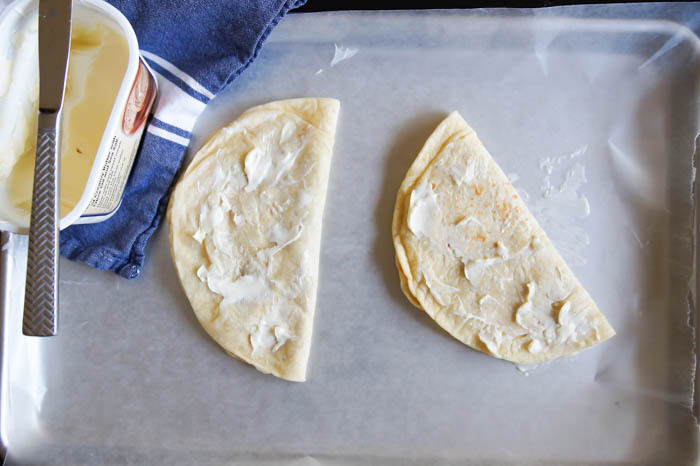 Spread spreadable butter over both sides of the tortillas. Set aside. Preheat grill to medium. Place the butter and brown sugar in the pan and cook on the grill until melted. Add the bananas in a single layer and cook on both sides until golden. Remove from heat. Place the prepared quesadillas on the grill and cook a couple of minute on each side until grill marks appear and the center is melted. Remove from grill. Cut each tortilla in half. Place one or two halves on each plate. Use a pastry bag or zip-top bag with a hole cut in the corner to top with marshmallow creme. Add caramelized bananas. Serve warm. We love the tortillas from HEB we get them every week! I think this will become in my favorite dessert! Can't wait to try it. Looks so delicious. I love all the ingredients of the recipe really. Banana is my all time favorite. 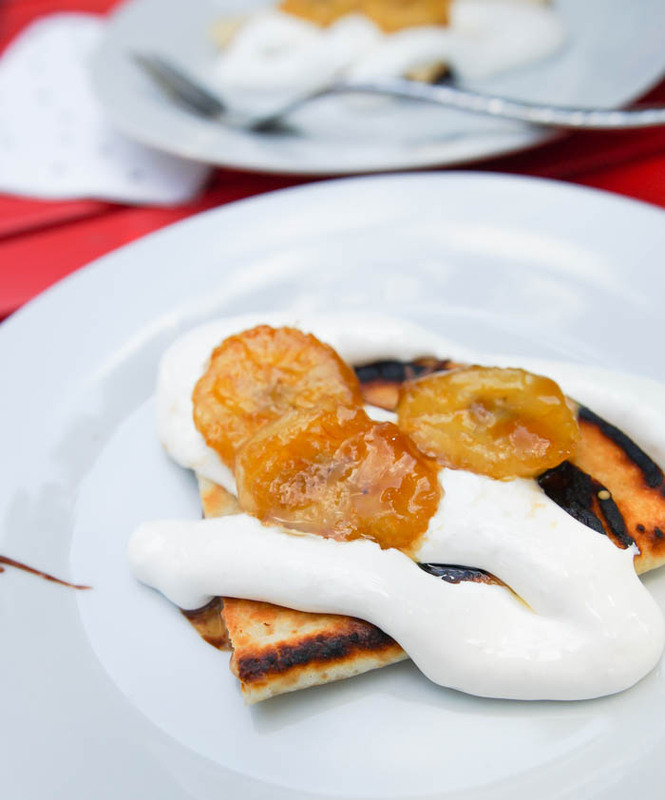 love the way you mix it with something yummy. thanks for sharing another great recipe.